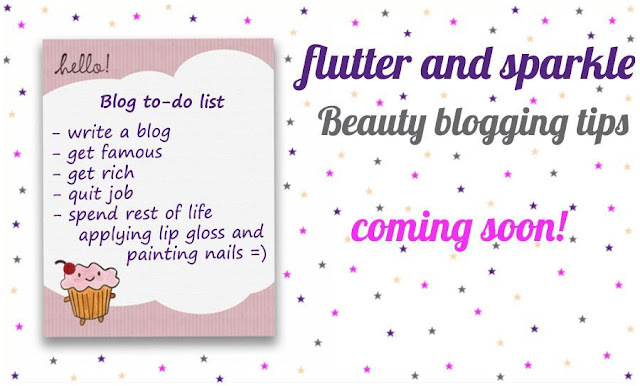 I've decided I'd quite like to write up all that I know about the world of beauty blogging in the hope that it might help new bloggers or those thinking about starting a blog. I know that I was extremely confused when I first started out, and my lack of knowledge actually put me off for a bit - it took me a long old time to really get into the swing of things and enjoy it enough to want to give up large chunks of my spare time to blog regularly. Now I don't for one second think I'm an expert, nor do I rate myself as a top beauty blogger / guru. I just see a lot of new / potential beauty bloggers asking a lot of the same questions and generally worrying about making mistakes / breaking the secret (non-existent!) codes of beauty blogging, so I thought I'd share what I've learned in my three years of blogging and I hope this series will help some people who are new to blogging or thinking about starting out. The posts I plan to write are in no way 'the rules'! I'm just going to be passing on my opinions, opinions I've heard from others, and information I've learned along the way and I'll be happy for anyone to have input through the comments. These are my planned topics for each post in the series - please do let me know if you can think of something I've missed out - I'll be starting with the first post next week (unless my fat fingers accidentally publish it before then!). How do I start a beauty blog and what should I name it? What's the best layout / font / style / theme for my beauty blog? What should I write about, how often should I blog and how do you stay organized? How do you get PR companies and brands to send you samples for your beauty blog? What's the right etiquette / rules to follow when working with PRs and brands? How do I get invited to beauty events / what are events like? How can I make money from my beauty blog? Sounds like a fantastic idea! I still class myself as a Blogger newbie so would love some tips! Really looking forward to reading this Gem, thank you! My blog is only 2 months old and even though I'm getting the viewing figures in I'm not getting as much followers so would love some tips and advice. Sounds great, really looking forward to it. I'm looking forward to this too! I've been blogging for over 2 years and I know exactly what you mean about 'the rules' that exist but don't exist at the same time. It's so easy to get heavily influenced by what others are doing that you forget why you started to blog in the first place!